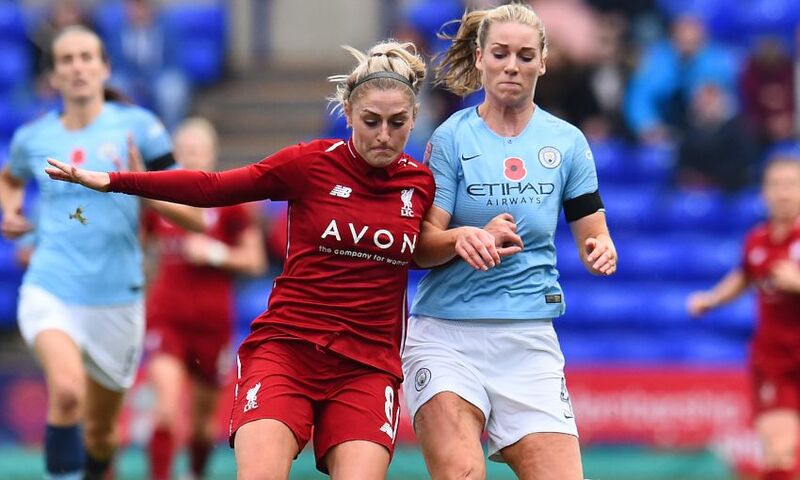 It was a frustrating day for Liverpool FC Women as they lost 3-0 to Manchester City FC Women at Prenton Park on Sunday. Vicky Jepson's side gave a good account of themselves in a goalless opening 45 minutes in the Women's Super League encounter, but City's quality in the final third ultimately saw them get the three points. Before kick-off, both teams observed a minute's silence as a mark of respect following the tragedy that unfolded at Leicester City's King Power Stadium last Saturday and also ahead of Remembrance Day next weekend. The Reds went into the game without influential attacker Jess Clarke but goalkeeper Anke Preuss was available to start after returning from injury. The stopper showed her quality on eight minutes when she made a brilliant save to keep out a Jennifer Beattie header from a corner. City, fielding former Reds captain Gemma Bonner and Scotland international Caroline Weir, carried a strong threat but Liverpool defender Sophie Bradley-Auckland stood firm at the back as she made a series of superb and vital interceptions. Jill Scott fired a good opportunity over the bar from close range for the away side, before Jepson had to make a change when Niamh Charles was unable to continue and Kirsty Linnett replaced her in attack. Just past the half-hour mark Weir found space inside the Liverpool penalty area but Preuss was the obstacle with another point-blank save. The Reds ended the opening half strongly and came close when a free-kick was headed back across goal from Niamh Fahey, only to see City scramble the ball away from the six-yard box. Nick Cushing's side took the lead four minutes after the restart in unfortunate circumstances; an attempted clearance from Fahey went into her own net. The visitors made it 2-0 just before the hour mark. The Reds defence was caught square and Nikita Parris nipped in and gave Preuss no chance with her finish. On 68 minutes, City went close again when Steph Houghton's free-kick hit the underside of the bar and somehow stayed out. Five minutes later from a similar situation, Houghton was unlucky again as her free-kick came back off the post. City did add a third six minutes from time, however. From a contentious penalty, Parris netted her second goal of the game. LFC Women have a break next weekend before resuming Women's Super League action away at Bristol City on November 17. Liverpool FC Women: Preuss, S. Murray, Robe, Roberts, Fahey, Bradley-Auckland, Babajide, Coombs, Charles (Linnett, 30), C. Murray (Sweetman-Kirk, 60), Daniels (Rodgers, 80).